Handmade Birds : Artists : Black Sunroof! “The return of Matthew Bower's latest project, Black Sun Roof - post Skullflower, post Sunroof!, post Total. 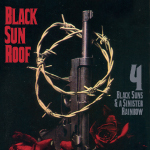 We've yet to pin down exactly what it is that BSR was sonically designed to do, other than kick up a fantastically psychedelic skree, which this new double disc most definitely does, and if anything, of all of Bower's recent releases, and even the last few Black Sun Roof records, this one is definitely the most varied, and most musical. Harkening back to that very first cd-r. There's still some of Bower's recent black metal obsession lurking around in the shadows, and of course elements of all those previous projects are still definitely present, but on these two records, Bower and his musical partner Samantha Davies, have cooked up some ultra fried, zoner psych of the highest order. It's varied enough, that if any record deserved a track by track breakdown it's this one, but that's a whole lot of tracks, so let's just pick some highlights. The opener definitely sets the stage, with some murky processed vocals, buried under heaving slabs of crumbling sound, distorted buzz, and squealing feedback, and then, slowly surface, some skittery drum machine, the guitars blossom into a weird grinding tangle of distorted melodies, as the drum machine unfurls a lockstep groove, the whole thing strangely loping and mesmeric, the main 'riff' sounding almost like burst of shorted out static, or black buzz chopped into weird grooves, the second half of the two part opener is more of the same, just cranking everything to 11, the vibe sort of folky, reminding us like a way more bleak and black take on recent Record Of The Weeker Dan Friel, or even Dan Higgs. A tranced out noise-dirge mantra that we could listen to forever. And while a casual glancing listen to most any of these tracks might reveal nothing but bursts of noise, headphones help get lost in Bower's impossibly dense soundscapes, from grinding, looped locomotive buzz, soft noise drifts, to melting black metal slo-mo dirges, to dense, feedback drenched Sunroof! style ur-drone raga blow outs, all keening shards of jagged noise and heart of the sun howl, to downright post industrial prettiness, all woozy and warped, buried melodies, and slow shifting textures, haunting and seriously cinematic.